Jon Danzig's World: Who says we don't need the Human Rights Act? Who says we don't need the Human Rights Act? The government says, that’s who. And yet.. it’s the government – and governments – against whom the Human Rights Act is supposed to defend us. Human rights law is only about protecting citizens of abuse by the State. And yet.. here we are, with the government of Britain – our State – wanting to reduce the very rights that would protect us from their abuse. And all seemingly with the explicit consent of large numbers of the population and the backing of much of the press. How has this come to pass? Why are so many people so fervently against a law that can protect them from the excesses of the State; the power of our government to over-reach itself and to do harm to people – to us? Is it because people don’t believe that the State can do us any harm? What about the Brazilian, Jean Charles de Menezes, a totally innocent man, who 10 years ago was shockingly shot dead by police on the London underground when they mistook him for someone else. He was shot 7 times in the head at extremely close range, without any warning or notice, or any chance to surrender, and died instantly. No officer was prosecuted or ever disciplined for any offence. Next week the failure of any police officer to be brought to account for the killing will be heard at the European Court of Human Rights in Strasbourg – the court that the British government apparently doesn’t want to recognise anymore. Whatever your view of the de Menezes case, can anyone truly believe that there is no case to answer? And since we are talking about harm of an innocent citizen by the State, doesn’t it make sense to have the case ultimately heard, not in a State court sitting in judgement of the State, but in an independent international court? It’s true that the public’s view of the circumstances of the de Menezes case is still mixed, primarily because initially the police and press reported that Charles de Menezes had jumped over a barrier and failed to stop when police commanded him to do so. That version of events turned out to be completely untrue, but people still believe it. 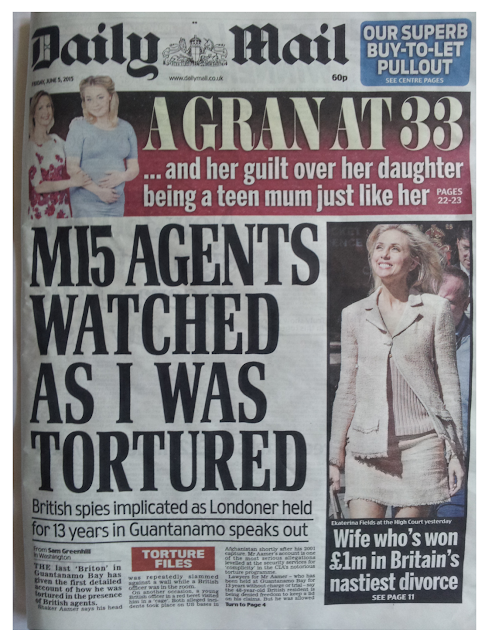 And what about the story in today’s newspapers about the last British resident to be kept prisoner at Guantanamo Bay, Shaker Aamer, who has given a detailed account of being tortured in the presence of British agents? It was front page news today in the Daily Mail (see photo). Yes, the Daily Mail, not exactly known as a champion of Britain’s human rights laws. In fact, the Daily Mail is campaigning against Britain’s “farcical” Human Rights Act and supporting the government’s plan to scrap it and possibly to withdraw from the European Convention on Human Rights and the jurisdiction of its linked Court in Strasbourg. But in the case of Mr Amer, the Daily Mail has been campaigning for his release because he has been 'tortured and imprisoned without trial' – a clear breach of his human rights under the Human Rights Act. Does the newspaper believe that human rights cases only apply to some humans and not to others? Mr Aamer told his story to a doctor at the camp and she quoted him extensively in her medical reports, which have now been publically released. Dr Emily Keram, a psychiatrist, described how Mr Aamer was beaten, shackled in painful ‘stress positions’, deprived of sleep, given frostbite and mentally ‘destroyed’ by his interrogators. Article 3 of the Human Rights Act contains an absolute prohibition of torture. Article 6 of the Human Rights Act guarantees the right to a fair trial. The Daily Mail, however, was not so sympathetic to the case of Abu Qatada, a Jordanian ‘radical cleric’ who sought – and obtained - asylum in Britain in 1993. Qatada was wanted back in his home country on alleged terrorist charges, but there was the possibility that evidence against him had been obtained by a “witness” under torture, and that Mr Qatada himself might be tortured too if he returned. Torture is absolutely forbidden under the Human Rights Act, and so despite several attempts by the British government to deport Mr Qatada back to Jordan, appeals courts prevented the move under the protections provided by the human rights law. In 2013 the Daily Mail sympathetically reported Prime Minister’s David Cameron’s plan to “temporarily withdraw” from the European Convention on Human Rights so that they could get rid of Mr Qatada back to Jordan. The Daily Mail clearly didn’t like Mr Qatada (and I also don’t have any sympathies with his radical views) but the Daily Mail didn’t editorialise that, “Abu Qatada may be a bad man but he deserves a fair trial, free of the threat of any evidence obtained under torture.” Instead, the Daily Mail campaigned for Mr Qatada to be kicked-out of the country, whether or not the evidence against him in Jordan was suspect. In the end, the British government agreed a Treaty with Jordan that any evidence obtained by torture would be disallowed in any trial of Mr Qatada. Once that agreement was signed, Mr Qatada voluntarily agreed to fly back to Jordan, and at the trial that eventually took place, he was found not guilty. The government has made clear it wants to scrap the Human Rights Act, and if necessary to withdraw from the European Convention on Human Rights, because it hasn’t liked some of the rulings of the European Court in Strasbourg. Similarly, the Daily Mail has shown that they are prepared to champion some cases of human rights abuses, but not others. But isn’t the thing about human rights that they should equally and universally apply to every human; to you and to me; even to foreigners and criminals; and even to humans we – or the British government, or the Daily Mail – don’t like?